Your child had surgery to remove the adenoid glands in the throat. These glands are located between the airway between the nose and the back of the throat. 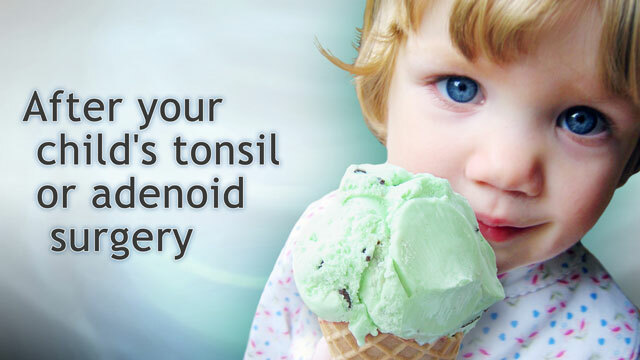 Often, adenoids are removed at the same time as the tonsils (tonsillectomy). Complete recovery takes about 1 to 2 weeks. If only the adenoids are removed, the recovery most often takes only a few days. Your child will have pain or discomfort that will get better slowly. Your child's tongue, mouth, throat, or jaw may be sore from the surgery. If there is bleeding in the throat and mouth, have your child spit out the blood instead of swallowing it. Orange and grapefruit juice and other drinks that contain a lot of acid. Rough foods like raw crunchy vegetables and cold cereal. Dairy products that are high in fat. They may increase mucus and make it hard to swallow. Your child's health care provider will probably prescribe pain drugs for your child to use as needed. Avoid drugs that contain aspirin. Acetaminophen (Tylenol) is a good choice for pain after surgery. Ask your child's provider if it is OK for your child to take acetaminophen. Low-grade fever that does not go away or a fever over 101°F (38.3°C). Bright red blood coming from the mouth or nose. If bleeding is severe, take your child to the emergency room or call 911. Vomiting and there is a lot of blood. Breathing problems. If breathing problems are severe, take your child to the emergency room or call 911. Nausea and vomiting that continues 24 hours after surgery. Goldstein NA. Evaluation and management of pediatric obstructive sleep apnea. In: Flint PW, Haughey BH, Lund V, et al, eds. Cummings Otolaryngology: Head & Neck Surgery. 6th ed. Philadelphia, PA: Elsevier Saunders; 2015:chap 184. Reviewed By: Josef Shargorodsky, MD, MPH, Johns Hopkins University School of Medicine, Baltimore, MD. Also reviewed by David Zieve, MD, MHA, Isla Ogilvie, PhD, and the A.D.A.M. Editorial team.